The Carmel Jazz Trio, a group of CHS musicians who came together late last year, is finding success on and off campus, and making beautiful music to boot. The trio is comprised of three talented jazz musicians from Carmel High: sophomore guitarist Robert Papacica, junior violinist Peter Mellinger and junior bassist Jonah Svihus. Although the three play a variety of jazz styles, the group focuses on gypsy swing, a genre of music with roots in 1930s France. The trio began collaborating in late December. For the Carmel Jazz Trio, First Night Monterey was not only a celebration for the first day of the New Year; it was also the mark of the group’s first public performance. 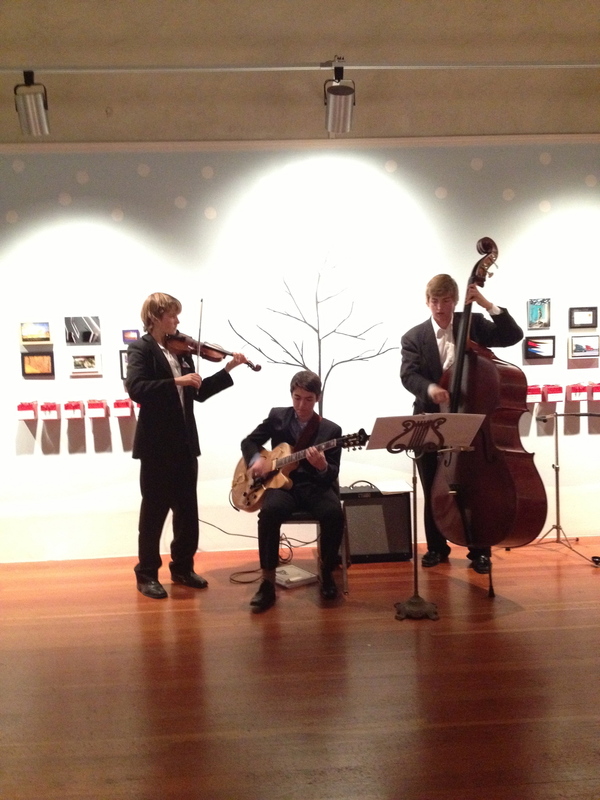 At First Night, they showcased their talents and music for the community, playing three separate 30-minute showcases at the Monterey Museum of Art on New Year’s Eve. The group called it a success. After its first gig, the group has plans to spread its music across the peninsula. Papacica says that they have a lot of musical ideas, both individually and as a group, and collectively they hope to start playing in local restaurants. All three members are established musicians on and beyond the peninsula, and together they play with an exceptionally high level of skill, technique and passion. This past year, all were chosen as members of the Monterey County High School All-Star Band, a selective group of jazz musicians drawn from local high schools that toured in Vancouver and Seattle during the summer of 2012. In addition, all three are part of the CHS Jazz Ensemble, and each is an important musician in other prestigious groups: Robert a guitarist in The Brecker Band; Jonah a bassist in the Monterey County High School All-Star Trio and three-year CCS Honor band member; and Peter a violinist for Youth Music Monterey Honors Orchestra and Chamber Players and the Carmel Strings quartet. Handley also hopes that the ambition and talent of the group will inspire other musicians in the department not only to push themselves and excel, but to form new musical groups of their own and establish themselves in the local musical scene.